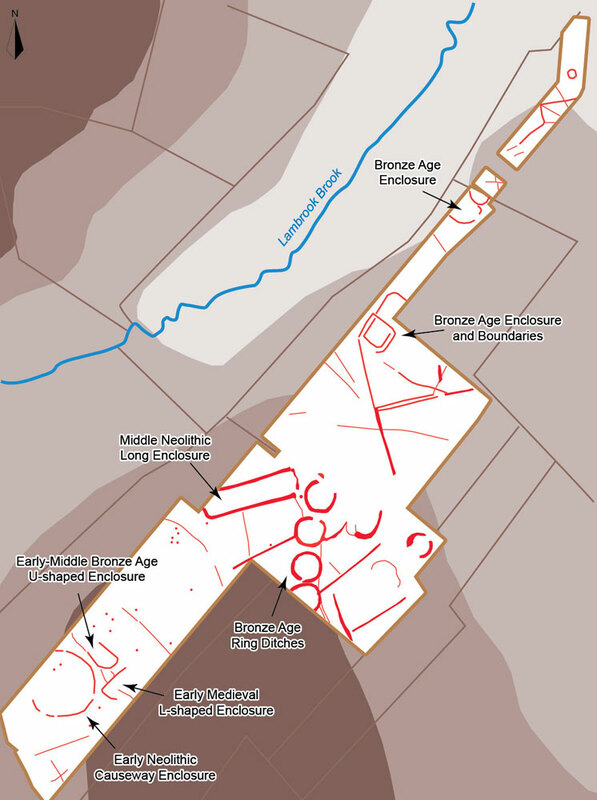 The construction of a gas pipeline between Ilchester and Barrington in Somerset provided the context for the completely unexpected discovery of an Early Neolithic causewayed enclosure within a complex of later monuments including a Neolithic long enclosure, a Bronze Age U-shaped enclosure, and Bronze Age round barrows, enclosures and field boundaries (see map on the right). The discovery was made at Netherfield Farm, South Petherton, and is the first of this type of monument complex to be found in Somerset. The archaeological work comprised the sample excavation of the causewayed enclosure and nearby features, together with the south-western end of the long enclosure to the north, as well as the later, Bronze Age, ditches lying within the land-take of the pipeline. The causewayed enclosure was one of the smallest recorded so far, at 55 m in diameter, and had discontinuous, shallow ditches containing few finds. 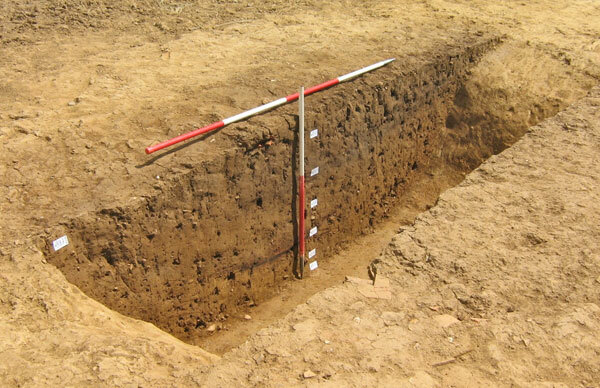 By contrast, the long enclosure, 50 m long and of a form sometimes called a ‘mortuary enclosure’, had large ditches containing layers of charcoal and relatively large quantities of pottery and flint-work, particularly from the upper fills of the ditches. 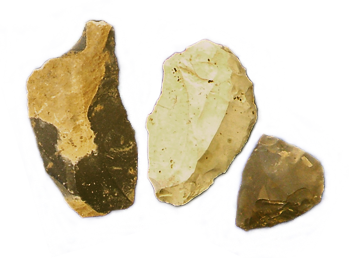 It appears that later activity may have included food preparation and the manufacture of arrows. A series of radiocarbon dates from both monuments conform to chronologies found more widely, with the causewayed enclosure constructed around 3700 BC, and its usage partly overlapping with the construction and usage of the long enclosure, from about 3500 BC to 2900 BC. Bayesian modelling of the dates has allowed a more precise estimation of the chronology of these monuments than would have been otherwise possible, and the long enclosure in particular is one of the most effectively dated in the country. The U-shaped enclosure was formed of five lengths of ditch of different form, and seems to have been partly palisaded. The imprecise dating was early to middle Bronze Age. It was probably partly contemporary with the ring-ditches found on the geophysics and may have had a mortuary connection. The enclosures and boundary ditches further north may have been slightly later forming aspects of settlement following on from the use of the site for burial. Another surprising discovery was the dating of several pits in and around the causewayed enclosure (some containing charred cereal remains) to the 5th to 6th centuries AD. These features were without pottery and were only datable by radiocarbon. The L-shaped enclosure next to the causewayed enclosure was of a slightly later 7th to 8th-century century and together these features indicate an enigmatic early medieval occupation of this site. The causewayed enclosure and the monuments that followed are remarkable for their inconspicuous siting, not located like many prehistoric monuments on a hilltop or a natural route-way. The area lacks topographic distinctiveness, but nonetheless seems to have been the focus for ritual practices over a period of a thousand years or more, and was much later used in an opportunistically for settlement in post-Roman times.